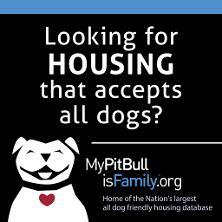 If you know of a Pit Bull friendly rental property or if a rental has changed their pet policy, please take a moment to share the info. Most supporters agree that the search definitely takes more effort - it can be just long and hard. Make sure you know the rules for your area ... fences, yards, leash laws, etc. A related question we are frequently asked is ... I am looking for long-term dog sitting or temporary foster care for my dog while I am in transition - can you help? BCBC cannot provide foster or long-term care for dogs, we do not have the resources to do it ourselves and do not know of any organizations or businesses providing this type of care. The best recommendation we can provide at this time is to work with family or close friends and see if they can help you. If and when better information becomes available, we will be sure to share it.